Previous PostUNLOCKED PROTRADER: Homo Magiconimus and DarksteelNext PostWait, What? If you had to rate your targets, would you agree with something like this? I know that I’m not the author, but on playability I’d move Eidolon up to #2 on your list. Fair Enough. I just don’t play red so I guess I’m biased. I need to work on my bias against red and blue… LOL. I hate speculating on burn decks and I hate playing them even more. Seems like burn is the most likely deck to flip-flop its creatures at any point anyway. A new one always comes along. If your reasoning is Legacy Play… I might consider foils a good pickup but I’d still rate non-foils below any card that sees Modern play. Plus foils are already expensive. This was not a rating system I thought about when writing the article but I’ll give it a shot. 3 & 4 were hard to place. This article is stupid. Any Magic player could tell me this information. When I read articles like this on a Magic Finance site, I want something interesting and new to read. This just looks like he looked at what cards see eternal play and then just put them down. Any idiot could tell you Eidiolon of the Great Revel is a good hold just like any idiot could tell you abrupt decay is a good hold. You should do some research next time and write a better article instead of this crap. Modern Master 2015 has already brought in massive amounts of previous Standard only players into the format. 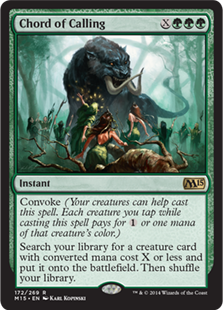 From talking to players at GP Vegas and some LGS’s I found out many of them didn’t know how to survive rotation with Modern in mind. This inspired the subject matter above. So far, the feedback from that profile of players has been positive. I’m sorry you feel this article was “stupid” but many others have benefited from it and I hope that you stop by next week and find my next article more tasteful. Brimaz is playable beyond standard. He shouldn’t be overlooked. I’d like to see an article for pickups at rotation when a lot of cards bottom out. Based on the long-term value. Obviously the Gods are good targets, I’ve been trading into a bunch of them on Puca. 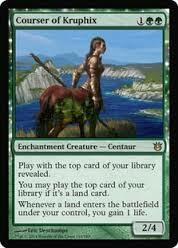 Scry lands are going to drop to what?… 1-2 dollars? That seems liek a great time to grab playsets of them. 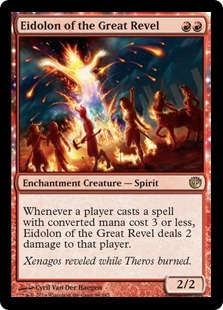 They will get an eventual reprint in Return to the Battle for Theros or whatever, and price jump like pain lands when they become standard legal imo. The Gods seem like the best long term value play from current prices, and I can’t wait to grab a ton more when they rotate. Thoughts? 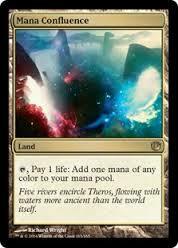 Scry land and Pain lands see next to no play paast STD (excuding the mind play of the U/R Scry in Twin decks). I’d say they will all be between $1-2 if they are not at that price already. 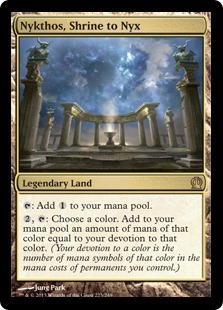 Picking up playsets is not a bad idea and could be useful in future STD like you said, but I don’t see much profit potential in the long term. Also Chord is a 3-4 of in Modern Collected Elves and Collected Abzan…but hey that was only roughly a combined 10% ofthe meta before Charlotte. This is not the first time you’ve made ignorant comments regarding Modern…it makes me think you know little of the format. Article was written pre-SCG Invitational due to the upcoming busy schedule. I only found a few lists messing around with a copy or two of Chord. The friends I knew that had been piloting said they preferred a list without it to increase the chance of hitting two relevant creatures. That paragraph could have been updated to imply “some play” instead of “lack of recent play.” It doesn’t change the point of the article nor does it water down my recommendation to pick them up.